Quebec City mayor Regis Labeaume says he's still optimistic about getting an NHL team to replace the old Nordiques — even if it won't be the one currently in Phoenix. The mayor of Quebec City says he's still optimistic about getting an NHL team — even if it won't be the one currently in Phoenix. Regis Labeaume sounded a cheerful tone Wednesday despite Glendale, Ariz., having narrowly voted to extend a lease agreement for an arena in a move that will likely keep the Coyotes there. 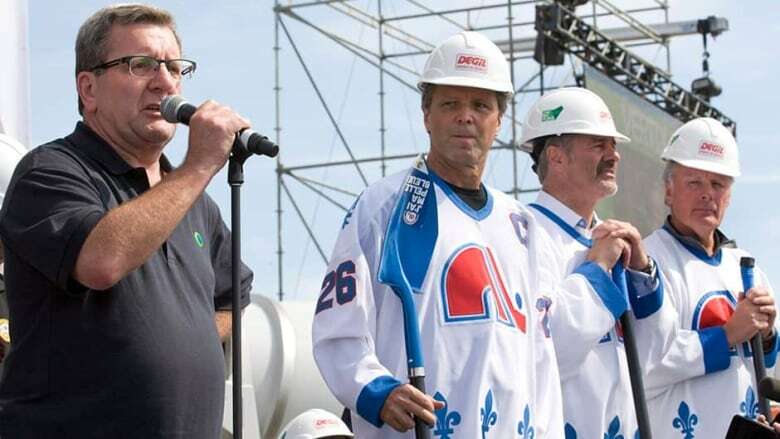 Quebec has begun building a $400 million arena, with mainly public money, in the hope of bringing back a pro team to replace the old Nordiques. The initial intention when the arena project began was to bring over the Coyotes. But now there's speculation that any move to Quebec City would have to occur through expansion. Labeaume said he's still "convinced" Quebec City remains part of the NHL's plans. He said Pierre Karl Peladeau is equally optimistic. The media mogul — who is also chairman of Quebec's power utility — is playing a central role in the effort to land a team. "You know, I'm not big on disappointment," Labeaume told reporters a day after the Glendale decision. "Pierre Karl Peladeau is like me: if it's not this one, let's try again. He's not the type to be disappointed, and that's not my style either." Quebecor Inc. has already purchased the naming rights to the arena, which was otherwise built with cash from the city and province. After months of controversy and uncertainty, the federal government bowed out of funding the project.